The Queen’s Baton, which heralds the launch of the twentieth Commonwealth Games in Glasgow, Scotland this summer, arrived this afternoon in Belize via the Philip Goldson International Airport. The baton contains a message from the head of the Commonwealth, Queen Elizabeth II, inviting athletes to join the Games. She will formally read it to open the ceremony on July 23. The baton is made of elm wood from the Isle of Cumbrae in Scotland, with a top of sculpted titanium and a granite gemstone which will be gifted to Belize on the baton’s departure. On hand to meet it were dignitaries of the National Sports Council (NSC) and Belize Olympic and Commonwealth Games Association (BOCGA), whose President, Hilly Martinez, reported that Belize is sending its largest delegation to Scotland this year with four, possibly five, disciplines represented: athletics, cycling, table tennis, triathlon and shooting. British-Belizean Andrew Wigmore, a descendant of the Gegg family, told us he hopes to compete for Belize in shooting, and is also helping to raise funds for the country’s participation in the Games. One initiative is endeavoring to have all of Belize’s sporting gear made from completely recyclable material. At the Airport, Belize Rural Central area representative Dolores Balderamos Garcia and Ladyville Village Chairman Albert Magdaleno formally kicked off the Belize leg of the relay, which lasts four days. Cycling Federation of Belize president Dion Leslie received the baton from Magdaleno and handed it over to cyclist Orson Butler, who led a parade of top Belizean cyclists including prospective participants in the Games, Marlon Castillo and Byron Pope, the latter bringing the baton to Memorial Park where it was received by Belize City Mayor Darrell Bradley. Bradley and organizers of the relay planted three trees in the Park to mark the third visit of the Baton and also in commemoration of Queen Elizabeth II’s 88th birthday today, Monday. Later, the Mayor and athletes representing Belize’s sporting disciplines will relay the torch through the principal streets of the City to the old Government House (House of Culture), where Governor General Sir Colville Young will host a reception. The Baton travels to the South of Belize for the first time, with stops in Punta Gorda and Dangriga, before ending its tour in Belmopan on Thursday. It will travel on to Bermuda and Canada, having covered 58 Commonwealth Nations out of 70 (Belize is number 59). Belize has participated in seven Games from 1962 and has never medaled. The British Broadcasting Corporation (BBC) are covering the relay through the services of adventurer and documentary maker Mark Beaumont, who is following the relay and interviewing athletes from all 70 Commonwealth nations. The Queen's Baton...it's on its 3rd trip, which will last for 288 days, where it will visit 70 Commonwealth nations, spanning over some 190,000 KM - or 118,000 miles. "The handle: elm wood from a tree that fell in the gardens of a place that's called Garrison House in old fortress on the isle of Cumbrae and the top is made out of titanium, it's all one piece, and it's made through a methodology called a laser sintering which is effectively 3D printing. In the top is a little piece of granite from Ailsa Craig just off the Scottish coast and we will gift that to the country when we leave. It's a little of Scotland that remains behind and it's the first time it's ever been done." 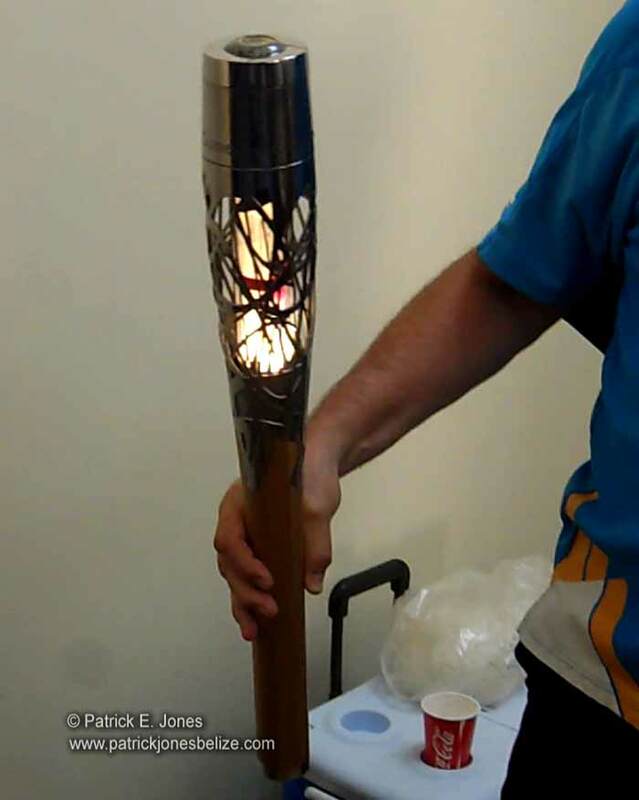 A first time that Belize gets to keep a piece of the Baton itself, but as was done on the last 2 times it made its way to Belize, it went on a ceremonial journey from the Airport to Belize City. From the airport, the Belize Rural Central Area Rep, walked a 50 yard's, where she handed it over to the Ladyville Village Chairman, who then, did his trek to hand it over to the President of the Cycling Federation of Belize. He then walked it to the Cyclists who made their way out of the airport. "The games are the second largest multisport games after the Olympics, so it's very significant sporting event on the calendar around the world. We certainly cherish the opportunity ourselves to take it from country to country. I believe anyone here who gets the opportunity to carry it should feel proud and when they see Her Majesty with that baton in her hand on July 23rd, people can look at it and say I was part of that, I've held that baton." 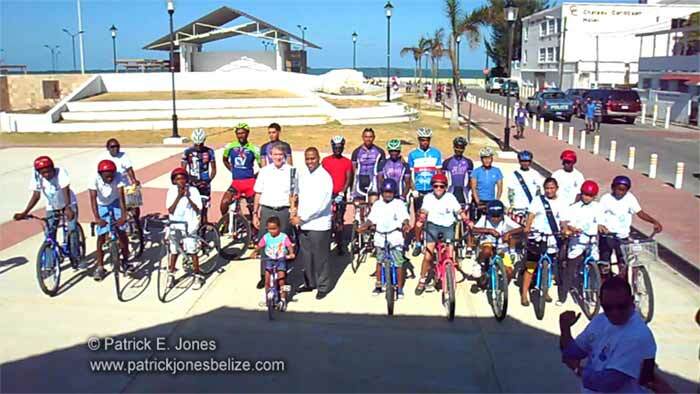 The cyclists took the Baton on relay from Ladyville to Belize City, where it was handed over to Mayor Darrell Bradley. He accepted the baton, where a short ceremony was done at the Memorial Park, which included plant of trees. Afterwards, Mayor Bradley donned running clothes, and took the baton on a relay through the City, where Minister of Sports Herman Longsworth also took a leg. That relay ended at the House of Culture, where another ceremony was held. The Queen's Baton started its journey on October 9 of last year, and it will be used in the Opening Ceremony of 2014 Commonwealth Games on July 23. It will stay in Belize for 2 more days, moving to select parts of the country, and it will leave on Thursday for Bermuda. 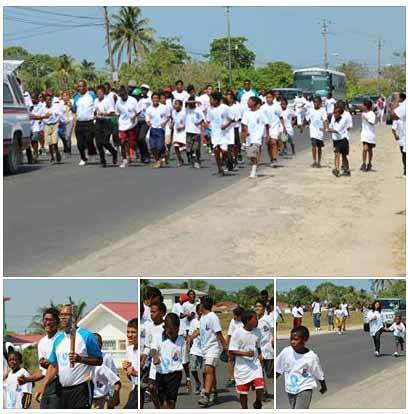 The Queen's Baton Relay made its stop in Belize this week. Here a few photos from the Belmopan ceremony held on Wednesday, April 23rd. 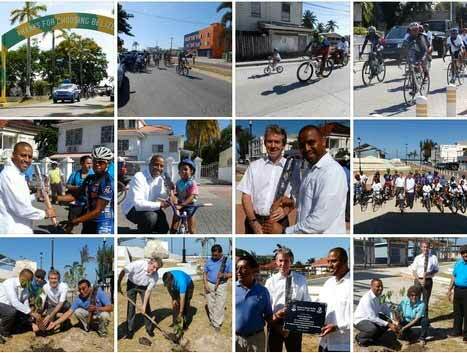 The Queen's Baton Relay came to Belize, and it biked through Belmopan on its journey. 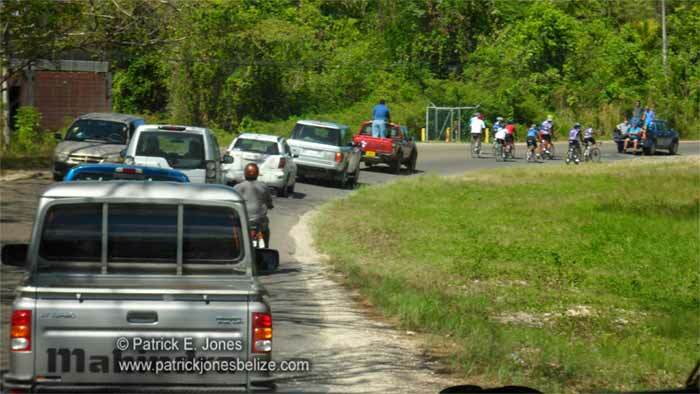 The British High Commission got some good pictures, as did the Cycling Federation of Belize.